This Friday will be the eighteenth edition of the Quiz that was launched on the Fundition Discord server. Want to participate? Stay tuned on Fundition! Every Thursday we will announce the time of the Quiz. It will change every week to meet with players from different time zones. Announcement: one on Thursday as a post on Steemit, one on Thursday in the Fundition Discord, one 2 hours before the Quiz, one 1 hour before the Quiz and one 15min before the Quiz. It is a ChronoQuiz! You have 20 minutes to fill in your points as much as possible. In addition to their gain, each of the three winners can choose a project that will get a small support from Fundition. In the case you are a Founder, you can not choose your own project as Fundition always incentivize collaboration. The channel is in slow mode, which means that all participants have 10 seconds between each answer per question. So better to give an answer that you are sure about. If nobody is able to answer within 20 seconds and if there is no correct answer the question will automatically change. The result will appear for all participants at the end of the quiz. Every thursday you will know who were the winners of the last week quiz but it's also the reward day!. NB: in the situation in which the winner doesn’t want to get the prize he/she can decide to give the whole amount to a project. Participants agree to the Discord Rules in the about-fundition channel. Participants must be on the Weekly Quiz channel for the quiz. 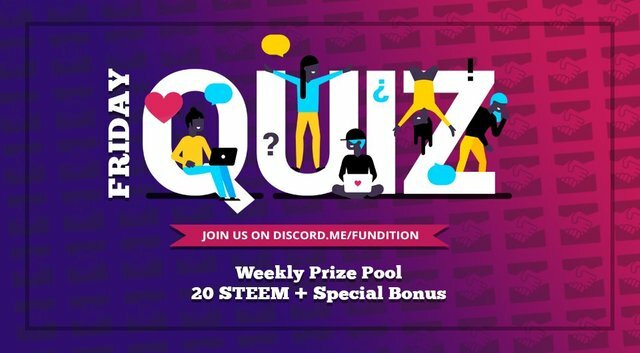 Each participant should follow @fundition on Steemit. Participants can join the channel at any time! Excuse me for the unrelated question, but is there a place I can look and see what projects currently have an open campaign going with fundition? Thank you. Even that same question in my mind.